Like the majority of modern-day Australians our family can trace at least part of our family line back to the British Isles and although much is made of convict history and transportation, like the majority of immigrants to Australia in the 19th Century, the Hendersons came of their own free will. Thomas Alfred Henderson was the founder of the Australian branch of our Henderson family. Thomas along with his wife and large, young family courageously made the journey from England to Australia in 1853 to make a new life for themselves in a strange land. 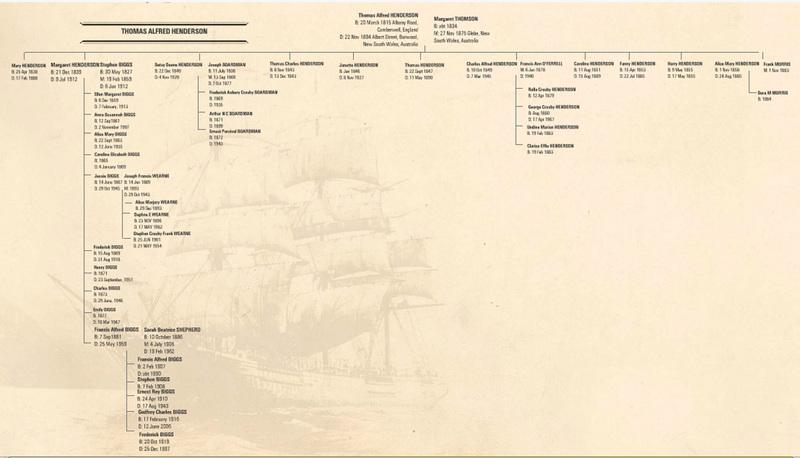 Our connection to the Henderson Branch of the family is outlined in the chart below. Thanks to Dinah Harvey whose years of patient research and writing have fired my enthusiasm for researching my family and provided the foundation for the details about the Henderson family history.